The cabochon is pressed glass, moulded with flowing ridges in a design that simply insists it's art nouveau. 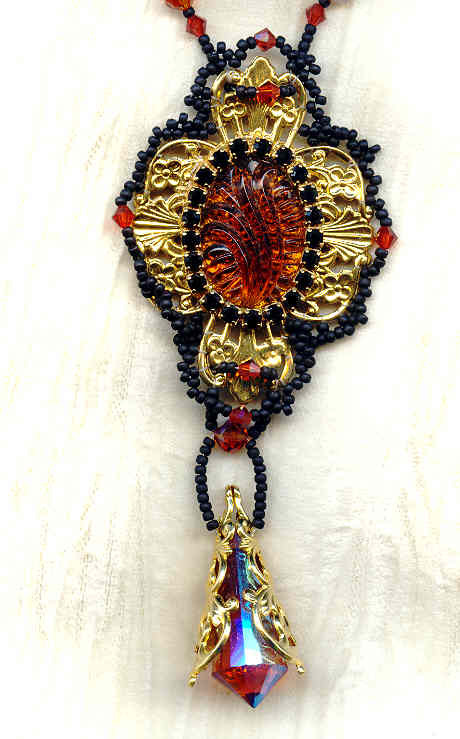 The stone is encircled by jet black Swarovski crystal rhinestone chain, against the bold gold background of a vintage gold plate filigree. The West German pendant is enveloped in an equally high-quality cone of gold-plate filigree, and suspended below the larger centrepiece. I've also used matte black seed beads and contemporary Swarovski Indian red 4mm crystal bicone beads to pull the pendant together. The finished pendant is roughly 50mm (2") wide by 110mm long (4-1/2"). 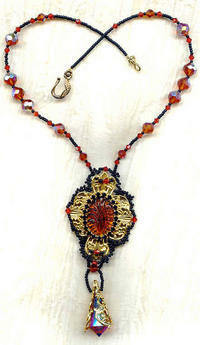 The pendant is suspended from 18" of vintage madeira crystal and matte black seed beads. As intoxicating as Napoleon brandy, the pendant and the necklace could only come from SPARKLE PLENTY. The tiny crystal pendants are vintage Swarovski crystal disks with radiating facets.